In this episode of These Warriors Are Terrible Big Mike steps down from the GM’s chair as Birdman rises to guide the crew through his favourite RPG, Shadowrun 2nd edition. 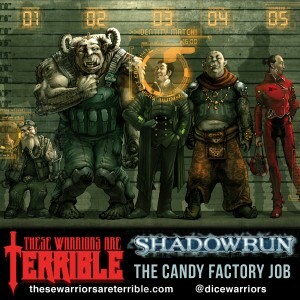 As the team of Justin Ecock, Tom White, Scotty Doo, Steve Saylor and Big Mike take the role of information hunters for hire, the runners of the shadow and their first target is… a Candy Company? In the wake of the Shadowrun RPG the crew of Tom, Steve, Scotty Big Mike and Justin sit back and relax to talk about their first time as Shadowrunners as Birdman talks about his first time running a campaign in twelve years while Big Mike explains where the madness of his character came from. The discussion then turns to greater philosophy about running RPGs and where a GM needs to improvise and when is it better to have a plan. The team of Scotty, Steve, Big Mike, Justin and Tom uncover a trap from an unexpected source and take over the security within the secret facility below the candy company. They manage to find all of their objectives within the hidden labs and plan to retrieve them all. However in true Terrible Warrior fashion the situation escalates quickly forcing the team to resort to one of the most desperate tactics in RPGs. Splitting the party. Will the team make it out? Will they capture their objective? Will they get paid? As Justin and Tom gather resources, Big Mike and Scotty rush in to save Steve from the latest incarnation of his curse known only as Spoo. What follows is a bevy of carnage and torture that will forever stain the image of Big Mike in the eyes of his fellow players. From that they gain the information and resources needed to sneak into the candy factory. As they sneak in they find Dr. Cullen. Are the Terrible Warriors in the clear? After learning about the dark ill tasting secret behind the Mr. Marigold’s Wonderful Cotton Candy Company Steve, Big Mike, Scotty, Tom and Justin start investigating to prepare to steal Dr. Cullen, the files and the canister. As they attempt to acquire a shipping truck the team immediately falls face first into trouble. Will the Terrible Warriors fall before the adventure even begins or will the muster the strength to overcome the already great odds?